Are we ready to enact happiness-guided policies? It has been four decades since economists began to be interested in a subjective measure, "life satisfaction", as an overall assessment of well-being. The science of "happiness" is now rich and deep, but only in the last few years have those studying it felt confident enough to significantly turn their attention to proposing concrete government policies. Recently back from the Global Dialogue on Happiness at the World Government Summit, Chris Barrington-Leigh, Associate Professor at McGill University’s Institute for Health and Social Policy and the McGill School of Environment, will discuss his recent work and the move towards a world in which policy is accountable to human-centred outcomes. 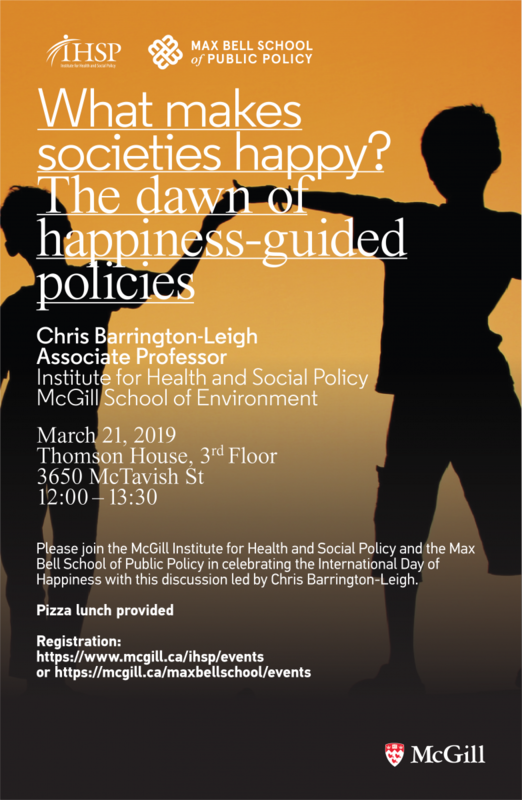 Please join the McGill Institute for Health and Social Policy and the Max Bell School of Public Policy in celebrating the International Day of Happiness with this discussion led by Chris Barrington-Leigh. Thomson House is located on McTavish Street, and has a wheelchair accessibly entrance from the righthand side of the building. The third floor ballroom is unfortunately not accessible by wheelchair. Gender-neutral bathrooms are available on the ground floor. If you require any accessibility accommodations, feel free to contact us.